The Edit button in the Podium Rendering Editor is grayed out and I can no longer use it. My icon for Image Editor in Sketch Up is also missing. What happens occasionally, is that you need more than one render in the list to be able to select the Edit icon. I have no idea why, it's not common, but it's annoying. 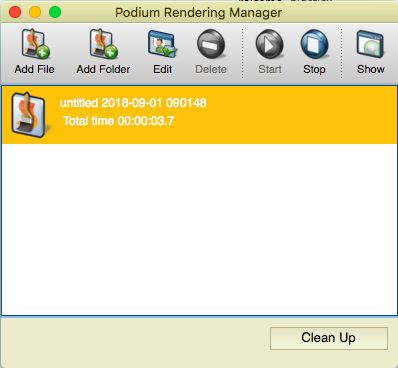 Can you post a screenshot showing the Podium toolbar and the Render manager window please? The Windows Snipping Tool is the best for this. If you haven't found it (a surprising number of people haven't) Type snipping into the Windows Search field and you'll find it. In my office it's so useful that everyone has it pinned to their menu bar. The Edit will be greyed out if SU Podium did not save the image. I have posted similar solution but I'll post this again. Skip down the File path length section. 1. The name of the path that the image is being saved to is too long or has special characters in it. Characters like ', ! !, # in the complete path name can be a problem. Also, if the path name is very long, this can cause SU Podium not to save the image to the custom folder you choose. 2. The model button and the custom button are on at the same time, in the Image Save location. Make sure only one of the options are on. There are some solutions to this issue. 1. Create a folder on your primary drive (for Windows, C:\, for Mac under your user name). Make it an obvious name such as c:\images. The folder must have write permissions in Windows or on the Mac, so make sure you can save files to the folder you want Podium to save rendered images to. 2. In Podium's Options UI, pick the Custom button in the Image save location and then pick the browse button. Then pick the c:\images folder. Now try rendering a simple model like a cube and make sure it is getting saved to the c:\images folder. The Edit menu item in OOPR should also be available.